Next week, GCU students will take to the polls and exercise their civic duty to elect a new ASGCU president and vice president. As you see all the posters and fliers around campus, take an opportunity to meet the candidates and learn their intentions for next year. Amber Christenberry, junior secondary education major, and Andrew Cuckie, sophomore finance and economics major, both have experience in leadership positions on campus. Christenberry is a member of the cross country and track and field teams. She serves with ASGCU and moderates intramurals twice a week. Cuckie is a member of the men’s soccer team and serves as a Lope Leader. He is a business tutor at the Center for Learning and Advancement. Amber: Running for this position has been on my heart for almost a year now and through time, prayer and experience, I have been searching for where I can be a servant for this campus. I was led to student body president. What have you done in your time at GCU that qualifies you to be ASGCU president? I am a member of the current ASGCU team. I have also worked with ASGCU intramurals and it helped me connect and build relationships with a majority of the students on campus. As a member of two athletic teams and the Student-Athlete Advisory Committee on campus, I can relate to that crowd as well. Through my experience and involvement on campus, I can relate to all of the students in one way or another. I feel qualified to lead as the ASGCU president because my heart is for the students and helping them have the best college experience possible. ASGCU is the connection between students and administration. How do you plan to foster this relationship? Through communication and partnership between ASGCU and administration, students will be able to speak their voices about the campus and be guaranteed that administration will hear what they have to say. Myself and Andrew plan to foster this practice consistently and often. To achieve the best for the student body and the University as a whole, constant communication and outreach to both students and administration will build a strong relationship. Commuter students often feel disconnected from campus events. What are your plans for involving them at GCU? There are many ways for commuters to be more involved at GCU. Through GCU emails, Facebook pages and marketing around campus such as bulletin boards and classroom windows, any commuter will have access to the latest athletic event, campus event and more. It is all about the marketing and word of mouth, and as the representative of the student body, I will ensure that commuters will have just as many resources as resident students. What do voters need to know about you? What voters should know about me is that if there is one thing in my whole life that has defined me, the good, the bad, and the ugly, it is that Grand Canyon University has saved my life and has molded me into a better person. I will carry that through the rest of my life. This University has been influential in my growth as a spiritual believer and a human being. I want to help my peers feel the same way about GCU, and by being elected president, the students will get nothing less than 110 percent of my heart every day. 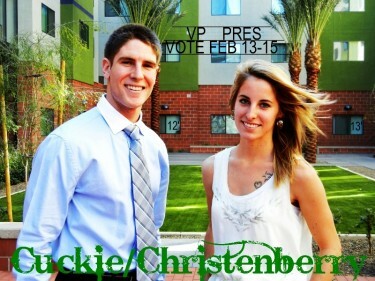 Voting for ASGCU Student Body president and vice president runs from Monday, February 13, to Wednesday, February 15. Vote in the Student Union between 11 a.m. and 2 p.m. A student ID is required. Contact John-Paul Reiger at john-paul.reiger@gcu.edu or 639.6892 for more information.